NEW YORK—Alan Ayckbourn’s comedic drama “A Brief History of Women” has a misnomer for its title. Something more accurate would be “One Man’s Experience with Women Through the Decades,” or “The Life of an Unassuming and Relatively Insignificant Fellow.” Part of the Brits Off-Broadway Festival at 59E59 Theaters, the play examines key events in the life of Anthony (“Tony”) Spates (Antony Eden), and some of the women who cross his path. Subtitled “a play in four parts” and spanning 60 years, the story begins at Kirkbridge Manor in Great Britain. The year is 1925 and the jazz age is in full swing. With a massive party is taking place to celebrate the engagement of Lady Kirkbridge’s daughter (Laura Matthews), Anthony, then a local boy of 17, has been hired as a servant for the event. What’s most evident in this first scene is how, at the time, class distinctions and the walls between the sexes were beginning to break down. Lord Kirkbridge (Russell Dixon), a man with clear Victorian sensibilities, is revealed to be a sexist and drunken lout, while his wife, Lady Caroline (Frances Marshall), younger by almost 30 years, has a strong independent streak. At the same time, Lady Caroline is trapped in a sort of stasis by a society not yet willing to accept her for who she is. Even the regular manor house servants look down on her because she is not from “old money.” She does manage to give Anthony his “first proper kiss” before the night is out. In the second scene, taking place 20 years later, Anthony, now a teacher, has begun a relationship with a fellow instructor (Matthews), much to the dismay of the Headmaster (Dixon), who frowns on any public demonstration of affection. In scene three, taking place 20 years after that, it is Anthony who has become somewhat old-fashioned, especially in the wake of the changing social mores of the time. In the final scene, set in 1985, Anthony, has come full circle. Anthony now is the one who is setting the standards of propriety, which those working under him must follow. 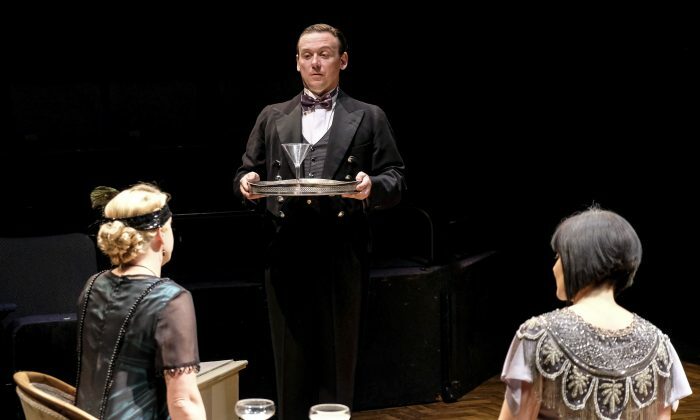 Class differences and sexual relations are common themes in Ayckbourn works, and “A Brief History of Women” is no exception. In this case, Anthony’s relationship with women (at least the ones we see him with) all start off with an obstacle: The ladies in question are either already married, and/or socially or emotionally unavailable. All of the scenes take place in the same location, though the function of the manor house itself changes over time. Eden does a fine job as Anthony. He’s a sort of everyman, who finds himself watching as events conspire around him. He’s sometimes a passive observer, other times a full participant, but in all cases, circumstances force him to make a decision. He’s never the one to make the decision first. Unfortunately, while doing quite well in the later scenes, Eden is unable to play a 17-year-old convincingly. He neither looks the part, nor is able to imbue it with any of the awkwardness or energy that goes hand in hand with that time of life. It’s strange they couldn’t have at least come up with a wig or a somewhat ill-fitting suit to make the character more authentic. It’s stranger still that, with Ayckbourn also handling the directing chores, he apparently chose to ignore this problem. The rest of the cast is also very good. Everyone but Eden plays multiple characters over the course of the play. Matthews does well as a woman haunted by a previous relationship. Dixon is wonderful as Lord Kirkbridge, the aforementioned headmaster, and a flamboyant director. Marshall strikes a powerful note as Lady Kirkbridge, a woman caught between two eras and unable to bridge the gap between them. Laurence Pears comes off well in his various supporting roles, though he is given little of substance to do. Louise Shuttleworth does a good turn as two women rather set in their ways of thinking (in 1925 and 1945), and as an unhappy housewife. The sets by Kevin Jenkins work nicely with the story, as do his costumes, particularly with the scenes in 1925 and 1965. Ayckbourn’s directorial choices, other than as mentioned above, are pretty seamless. The segments and accompanying through-lines flow nicely from one scene to the next. A nice touch is the fact each succeeding segment is shorter than the one that came before it. The information given allows the audience to quickly relate each new scene to what had occurred previously. Carefully planned out and executed, “A Brief History of Women” offers an interesting look at the pivotal moments of one man’s life, a life that seems quite ordinary until you get to know him.